Sample A “Residents in the Federal Republic of Germany” covers persons in private households with a household head, who does not belong to one of the main foreigner groups of “guestworkers” (i.e. Turkish, Greek, Yugoslavian, Spanish or Italian households). Because only a few foreigners are in Sample A it is often called the “West German Sample” of the SOEP. In 1984 it covered 4,528 households with a sampling probability of about 0.0002. Sample B “Foreigners in the Federal Republic of Germany” adds persons in private households with a Turkish, Greek, Yugoslavian, Spanish or Italian household head, which in 1984 constituted the main groups of foreigners in the FRG. Compared to Sample A the population of Sample B is oversampled with a sampling probability of about 0.002. The first wave included 1,393 households in Sample B. Sample C “German Residents in the German Democratic Republic (GDR)” consists of persons in private households where the household head was a citizen of the German Democratic Republic (GDR). This meant that approximately 1.7% of the residential population in the GDR in June 1990 was excluded from the sample as foreigners (who were mostly institutionalized). All in all, 2,179 households represent the starting size of this sample with a sampling probability of about 0.0005. Sample E “Refreshment” was added in 1998, selected from the entire population of private households in Germany. The households were chosen independently from the ongoing panel and its subsamples A through D, with the targets of increasing the number of observations of the general population and preserving its representativity. 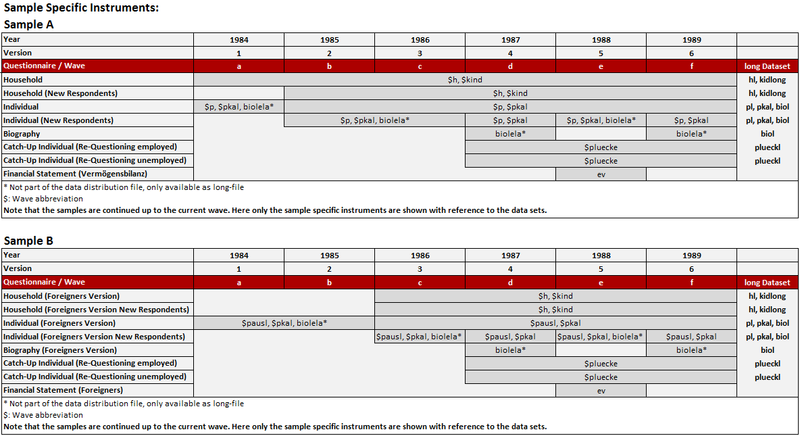 The selection scheme used for sample E essentially resembles the one used in subsample A. The number of households in the first wave of subsample E was $1,060$, with a sampling probability of about 0.00005. 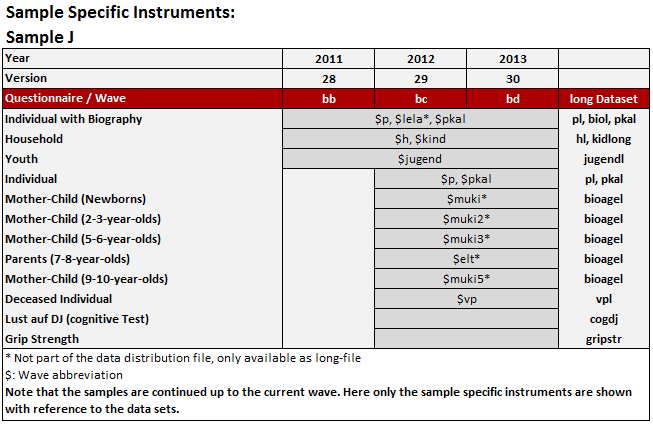 With the data distribution of 2012, parts of subsample E have been extracted into the SOEP Innovation Sample. It is also the first sample in which the Computer Assisted Personal Interview (CAPI) was implemented. Interviews in Samples A-D at this time were completely conducted using Paper-and-Pencil-Interviews (PAPI). To study mode effects, households of sample E were randomly allocated to CAPI and PAPI mode. Sample F “Refreshment” was selected independently from all other subsamples from the population of private households in 2000. The selection scheme was slightly altered compared to the previous addition in Sample E: while the ’German’ households (all adults greater or equal 16 in the household have German nationality) were selected with a sampling probability of $0.00028$, the ’non-German’ households (at least one adult does not have German nationality) where oversampled with a probability of 0.0005. Overall, the number of added households in subsample F’s first wave amounts to 6,043. Sample L1 “Cohort Sample” covers private households in Germany, in which at least one household member is a child that was born between January 2007 and March 2010. Again migrants identified by an “onomastic procedure” are oversampled. 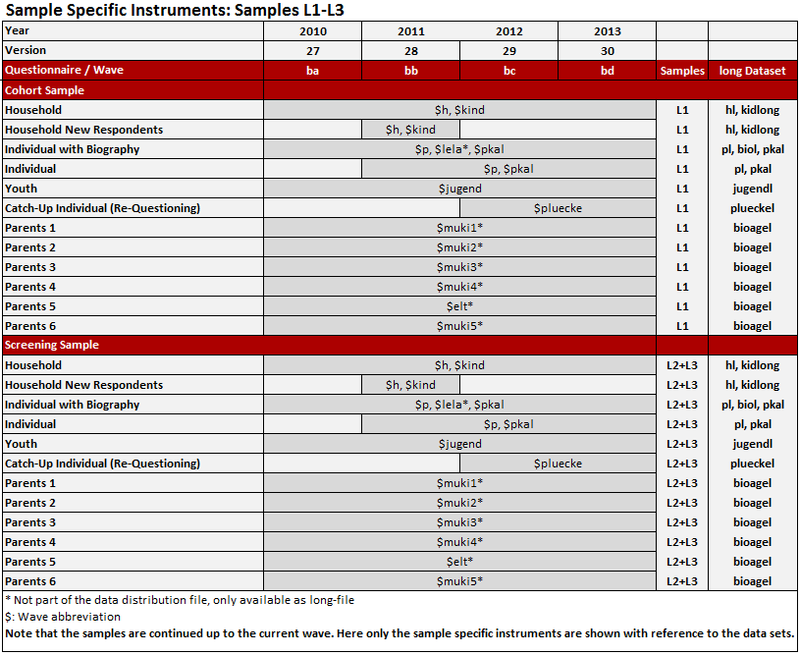 Sample L1 (as well as L2 and L3) was part of the SOEP-related study “Familien in Deutschland” (FiD), which was later integrated into the SOEP in 2014. As part of an evaluation project of the Federal Ministry for Family Affairs, Senior Citizens, Women and Youth (BMFSFJ) and the Federal Ministry of Finance (BMF) the study focused on public benefits in Germany for married people and families. Therefore, the survey instruments of waves BA to BD differ in some parts from those of the other samples. Sample L2 “Family Types I” covers private households in Germany that meet at least one of the following criteria regarding their household composition: single parents, low income families and large families with three or more children. Similar to Sample G we face the problem that the eligible sub-population is relatively small and an adequate sampling frame is lacking. So again, a preceding telephone screening procedure identifies eligible households. Sample L3 “Family Types II” covers private households in Germany that meet at least one of the following criteria regarding their household composition: single parents or large families with three or more children. It is conducted analogical to Sample L2 in order to increase the number of cases in these sub-populations. Sample M1 “Migration Sample” In 2013 a new migration sample was added with around 2,700 households drawn by using register information of the German Federal Employment Agency. It includes persons who immigrated to Germany after 1995 or migrants of the second generation. Sample M3 “Refugee Sample” in 2016 a new refugee sample was drawn for the IAB-BAMF-SOEP Refugee Survey in which roughly 1,769 households of displaced persons are repeatedly interviewed. Respondents aged 18 and older who entered Germany between January 2013 and December 2016 and who filed an asylum application until April 2016 (regardless of their current legal status) were interviewed as well as the members of their households. 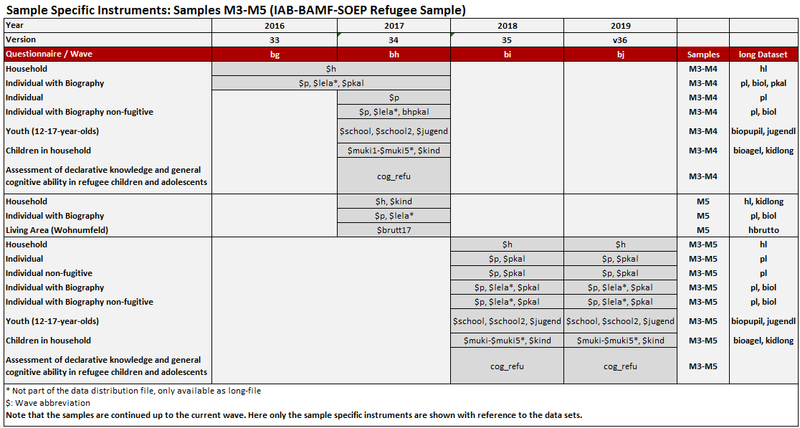 Sample M4 “Refugee Family Sample” The 2016 “IAB-BAMF-SOEP Refugee Survey” (Samples M3 and M4) is a joint project of the Institute for Employment Research (IAB), the Research Center of the Federal Office for Migration and Refugees (BAMF-FZ) as well as the Socio-economic Panel (SOEP). The target population of the samples consists of 1,769 households with individuals who arrived in Germany between January 2013 and January 2016 and applied for asylum until June 2016 or were hosted as part of specific programs of the federal states (irrespective of their asylum procedure and their current legal status). The first part of the sample (M3) was financed with funds from the research budget of the Federal Employment Agency (BA) allocated to the IAB. Sample M4 was funded by the Federal Ministry of Education and Research (BMBF) and has a focus on refugee families. Sample M5 “Refugee Sample” M5 is the acronym for the third top-up sample of refugee households. The population of M5 covers adult refugees who have applied for asylum in Germany since January 1, 2013 till December 2016, and are currently living in Germany. The first wave of M5 was conducted in 2017. M5 added another 1,519 households of refugees who have migrated to Germany since 2013 to the SOEP framework. Sample N “Refreshment Sample (PIAAC-L)” Sample N integrated 2,314 households of former participants of the Program for the International Assessment of Adult Competencies (PIAAC and PIAAC-L) in 2017. This is the most recent addition to the SOEP-Core samples. Fieldwork in sample N was conducted between Mid-March and Mid-August and thus slightly later than the majority of samples A–L1. In SOEP it is common for special samples to receive extended, adapted and/or integrated questionnaires in the first few years. This ensures that sample specific questions that do not play a role in the main SOEP can also be included. In the following tables you can see, which questionnaires the respective samples received, in which year they ran, in which raw data set they were included and in which long data set they flowed. From the start of sample B (foreigners), the individual questionnaire was able to be conducted either in German or in the respective foreign language. Starting with wave 2 of the panel, there were “old” and “new” survey units (households, persons), and there were survey units with or without certain changes (e.g. households that had moved or not; persons that had changed careers or not). The questionnaires took these changes into account for all sub-groups. Survey procedures and tools should ensured that each subgroup had received the right questionnaire programme for them. This technique as well as the bilingual design of the foreigner questionnaires should be retained for waves 3-6. In addition, retrospective information and missing information of temporary drop outs were collected. The financial statement, which is a survey module nowadays, was a separate questionnaire in the year 1988. The researchers in the SOEP were determined to seize the historic opportunity of the German reunification. Their goal was to obtain a first baseline measurement of incomes in the ‘old’ GDR currency. The questionnaire was prepared by a West-East working group, including DIW, WZB, Collaborative Research Centre 3 and the ISS at the Academy of Sciences in the GDR, with the participation of Infratest and its cooperation partner in the GDR. The result was a questionnaire which largely corresponded to the thematic structure and structure of the questions in the West questionnaire, but which dealt strongly with the GDR-specific peculiarities in terms of content (e.g. the housing situation). A major shift in the design of SOEP questionnaires was developed with the sample J. Due to the increased panel mortality from wave 1 to wave 2 that was observed for the refreshment samples F (2000- 2001), H (2006-2007), and I (2009-2010), the biographical module, with an average interview length of 17 minutes, was integrated into wave 1. If this were not done, no biographical data would be collected at all for approximately 20% of all SOEP respondents who would probably not have participated in wave 2. In comparison to the longitudinal samples, data collection in the first wave was focused on the main three questionnaires: the household, the individual and the youth questionnaire. As the fieldwork in these refreshment samples were exclusively conducted via CAPI interviewing, complex modules with event triggered question loops were manageable to include. The main focus of FiD was on the families and children – the parental questionnaires (filled out about their children) were about twice as long as the comparable questionnaires in SOEP-Core and questionnaires for the 1-2 year-olds and the 9-10 year-olds have been added entirely (as of 2012, SOEP-Core added a questionnaire for the 9-10 year-olds, which is partly comparable to the FiD-version). In large parts, FiD resembled the SOEP. Each adult person was asked to answer a personal questionnaire, which, in the first two years included retrospective questions on childhood, education, and early work experiences. In addition, there were several question designed to capture the challenges families face with regard to the return of mothers into the labour market – with respect to work place, work schedule, overtime, day care possibilities, etc. Following the design shift for refresher samples since sample J in 2011, the collection of life history by means of the so-called “biography questionnaire” was integrated into the individual questionnaire from wave 1. This ensures that biographical information will be available for all target persons that provided an individual interview in participating households. Other supplementary questionnaires were not involved into the survey program for first-wave respondents to avoid “overburdening” respondents with an extremely lengthy first-wave interview. Questionnaires in the migration boost samples include questions that have been part of SOEP-Core for the last three decades. In addition, the survey covers each respondent’s complete migration history, education, training and employment history in Germany and abroad, and numerous aspects of cultural and living environments relevant to the social integration of migrants. The household questionnaire is identical to the questionnaire used in the SOEP-Core sample. 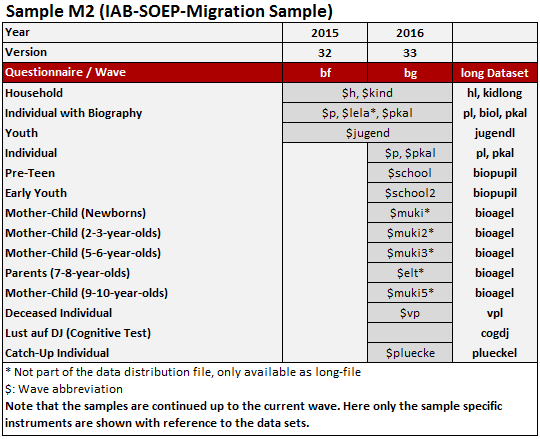 As with every other subsample of the migration population in the SOEP (M1 and M2) established previously, there was a clear need for several deviations from standard SOEP-Core questionnaires in order to reflect the special characteristics of the target group. Several additional questions concerning migration and integration were integrated into the individual questionnaire to better field the range of research questions and research goals of the cooperating partners involved. This included topics such as heritage, (experiences on) the way to Germany, language skills, integration classes in Germany, job experience, current occupation, educational background, health, attitudes, and values. The household questionnaire was much more SOEP-related in order to establish longitudinal information on the households.